Everyone loves news on the octuplets. Who wouldn’t want a quick fix on the mama who has 14 children under the age of 8? But when you think of their waste, isn’t anyone ready to say “Eight is enough”? How about one of those other snappy lines from the Simpsons fertility episode… Might we say they’ll have a “Love/Eight” relationship, at least with the environment? I, like everyone else in the blogosphere, have my own opinions about the birth of the octuplets to an already large family. That she is a single mother doesn’t so much bother me, though I know that being a single mama to one infant is struggle enough. Working out that juggling act we call parenting can be tough; add the weight of each child’s carbon footprint to worry about, and it’s downright difficult. 96% of American babies wear disposables, whereas only 6% of Chinese babies do. In India, 2%. Between 2000 and 2050, the U.S. will add 114 million kids to its population. Africa will add 1.2 billion—but their respective CO2 emissions will be the same. Zahara Jolie-Pitt will produce 45,000 lbs of CO2 yearly, compared with 221 lbs if she still lived in Ethiopia. One American child generates as much CO2 as 106 Haitian kids. We live in a very different world than we used to, people. One where eight babies (surprise!) can be born from one woman at the same time. Those babies will need a lot of nappies, and let’s all keep our fingers crossed that this woman signs her kid up for Bum Genius and the like and steers clear from the Huggies endorsments. The results on the comparative carbon footprint of our kids makes you rethink disposables. Even G Diapers aren’t eco-friendly unless you compost every soiled insert, and cheers to you if you do! 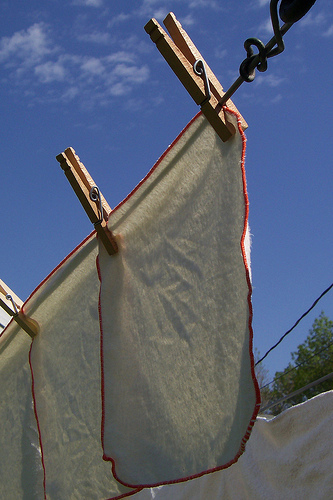 Line drying the cloth diapers is better than using even the most energy efficient dryer. And as Heather so clearly put it in Part 4 of the Baby Essentials that aren’t, you can “wipe” diapers off the need list earlier than you thought. Here’s the thing: we’re all obsessing over the size of the family and the circumstances of the births and how she will support her family. I agree with Heather on her diapering tips, and I think we should extend her suggestions to America’s mystery mother. If so, she’ll shrink down those carbon footprints so they can maybe fit into cute little baby moccasins. Image: mhofstrand on Flickr under a Creative Commons License. I don’t care whether Nadya Suleman has “only child syndrome” or not. I care that she’s a single 33 year old unemployed woman with six fatherless children (one of whom has autism) who lives with her bankrupt parents and intentionally had 8 more children who will probably have long term medical problems themselves due to her stupid decisions. Who’s going to pay for these 14 children? The bankrupt grandparents??? Though public records show that Nadya Suleman was on the payroll at Metropolitan State Hospital until last year, it appears that she did little work (if any) after September 1999 due to a workman’s compensation injury (back injury and psychiatric condition) in which she’s received up to $165,000 in compensation. She filed an additional claim for worker’s compensation for a separate car accident in which she argued that this car accident wouldn’t have occurred had she not been going for medical treatment for the earlier worker’s comp. injury. Currently Nadya Suleman is single, unemployed and has 14 fatherless children that will need to be supported by taxpayers for at least the next 18 years. Given her “history”, I’m sure she knows full well how to fund her large family and her stupid decisions. There are a lot of “huge” families that we know personally. After figuring and re-figuring, one family of 19 produces less carbon or anything else than a couple who is ultra-eco-friendly in downtown! Life style is a huge thing ya know! (And I am only speaking of here in the US.) When you produce 97% of your own food, compost all manure (human and animal), make your own clothing, shoes, diapers, wraps, menstrual pads, washable toilet paper, soaps, lanolin, and herbal tinctures, and grow your animals feed, make your house out of a recycled tobacco barn with reclaimed building materials, have no electricity (even solar panels/wind generators leave a huge footprint from manufacture), water coming from your spring/creek, home school your children without fancy curriculum, make your living from your land and being a home birth midwife, etc… then you will see what real life could be. What we’ve lost as a society is community, we have forgotten that community (and I mean serious community, not your neighborhood farm stand, or local library group) is the way to overcome overconsumption, overwork, overproducing of waste, etc… If you own things collectively and collectively do the work and don’t strive for worldly possessions, and don’t be so outside the box that you create your own box you might find a really interesting balance. It’s not as outlandish as it may seem at first read. It is happening all over the place, but these folks are under the fast paced radar. Biking your children to playgroup might feel eco savvy, but why not have them planting trees (that were grafted by Papa, not shipped from the latest organic mail order) with their 9 brothers and sisters in the community orchard that is within steps of your own home? Now that’s what we call playgroup! I might be being a bit hypocritical sitting here at this computer, but this will soon be turned off as well! We should watch ourselves instead of worrying about the footprint of that family with too many children. Until we can stop being consumers our concerns should only be with ourselves! We have to wean ourselves from all of our pacifiers before we can scoff at someone still sucking their thumb. I certainly understand the outrage, here, Lucca. It seems to be a great demo on overconsumption: the need to continue to have more and more and more, even if the “product” is children. I agree with you, Amy. Here at Green Options, we give many tips on how to be eco-friendly. I try not to push people too far to what I would like to be: my dh and I would love a self-sustaining farm. We’re taking our own steps to make that dream a reality. Not everyone can have chickens or a cow, though. I know that for most people, it takes baby steps. It’s the reality for most families. But yes, having a large family can be quite sustainable if they live as Amy suggests. That’s not only large families; smaller families like my own can strive for sustainability, too. However, from what I understand, that is simply not the case for Ms. Suleman. We can all wish her luck and hope that she turns to eco-friendlier living.